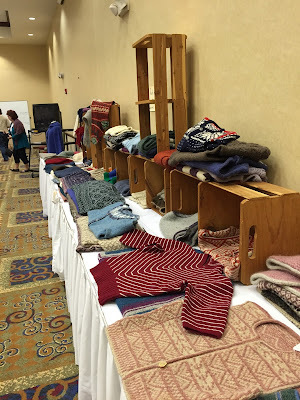 I'm still riding this high from Meg Swansen's Knitting camp last month and I have to say that some of the most exciting, inspiring parts about the weekend other than simply listening to Meg Swansen and Amy Detjen talk were the tables and tables full of sweaters designed and knitted by Elizabeth Zimmermann and Meg Swansen. This was just one of three walls lined with their work. I spent quite a bit of time looking at these pieces - studying the shaping, looking at floats, figuring out how they were constructed, checking out the steeks and buttonholes... it was such a treat to be able to not only look at these pieces, but pick them up, unfold them, turn them inside out, really study them to your heart's content. What a pleasure! 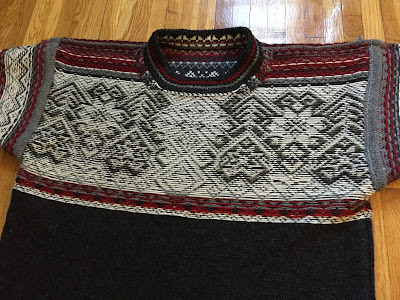 As soon as I got home I immediately began the process of designing my own Meg Swansen-inspired sweater. It is going to be a long journey as there are still perhaps 5 or 6 more swatches I would like to knit, but here are my first two "Swatch Caps." I should mention that these are unblocked because if we waited for that to happen then this blog post might never be published. 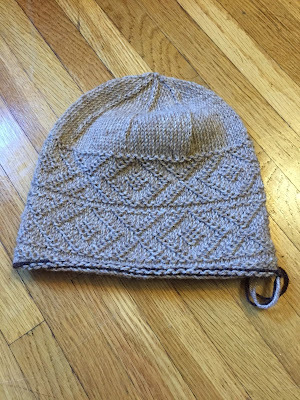 This first cap was knitted to practice the technique of Twined Knitting, where you knit from both ends of the same ball of yarn and alternate them every stitch, always bringing one over the other so that they twist together on the inside of the fabric. I've never done twined knitting before and it was slow going to start, but I LOVE the resulting fabric. Wonderfully dense, with an elasticity that bounces back so quickly you'd think it were made of rubber. This is one of those techniques that I have been meaning to try for years and after camp ended, I just thought "No time like the present!" 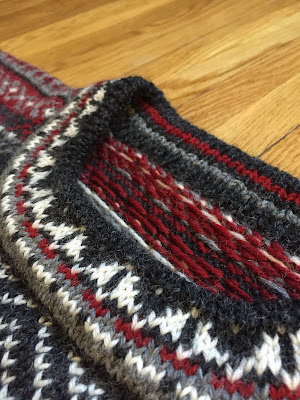 Traditionally Twined Knitting (or Tvåändsstickning) is done with Z-plied yarn and both strands held in the right hand, one strand always being brought over the other to complete a stitch. "Z-plied" refers to the direction the yarn was twisted and I can guarantee you that 99.9% of the yarn in your stash is not spun in this direction. 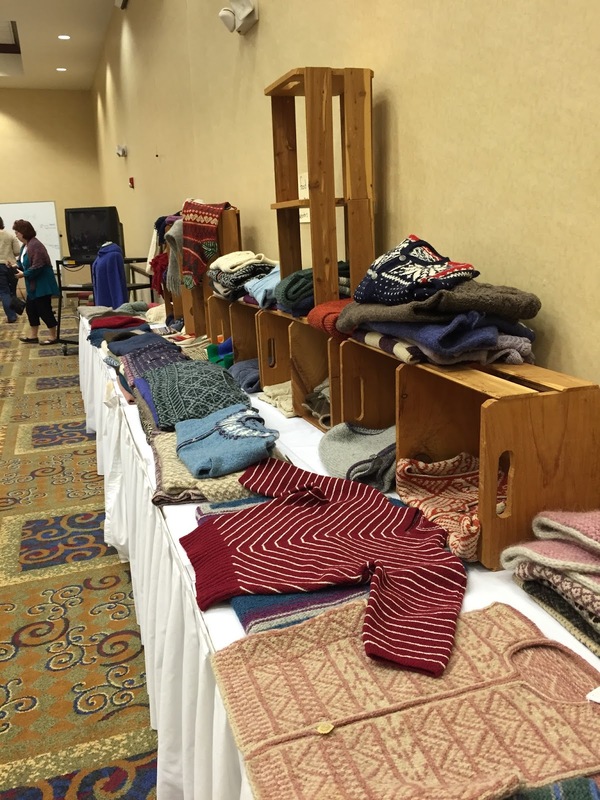 If you want the traditional stuff, you can get it here from Nancy Bush. I have a bunch in my stash. It's beautiful. But I digress... My cap was knitted with a regular S-plied yarn, Rauma Strikkegarn, and I held both strands in my LEFT hand and always carried one strand under the other to twist them. Why? Because that's what felt comfortable. You can see that the technique can give you a very deeply textured knit/purl pattern that I have fallen so in love with. Cap two was also knitted with Rauma Strikkegarn (can you guess what yarn I'm going to use to knit my final sweater?) but this time using the more common stranded technique of always carrying one color over the other to prevent them from twisting on the back of the fabric. Both of these caps were meant to check gauge, so I simply chose a stitch pattern I liked and took off. 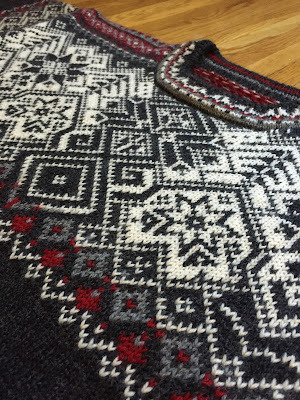 The finished sweater will combine both twined knitting and stranded colorwork, but not with either of the patterns seen above. I still have quite a bit of playing to do, modifying the techniques involved to attempt to match gauge between the two. As it stands, on the same needle size twined knitting is giving me 7sts/inch and stranded colorwork is giving me 6sts/inch. It shouldn't be too hard to find some middle ground. I finally allowed myself to sit down and work on a project for myself because I finished a GIANT commission that had been bogging me down for quite a while. 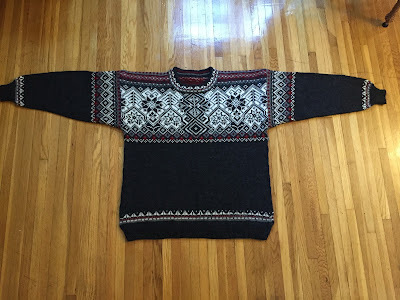 Let me tell you right now, if anybody else wants an XXL Norwegian sweater, you're going to have to knit it yourself because this one near did me in. But I'm rather proud, because I only cried once while knitting it. And it was when I thought I was done knitting. I sewed one shoulder together, was preparing to cut the neck steeks and discovered that they weren't centered. The entire neck hole was in the wrong place. I almost lost it at that point, but thank god I hadn't cut those steeks open yet. I had to rip back 5 hours (because clearly that's how we track our knitting progress on things like this) and do the top of the yoke over again. But now I can do my final happy dance because the sweater is done, blocked, and shipped off to its owner for good. I'm so glad you're blogging again. I have been reading your blog for years, and you always have such interesting projects happening! 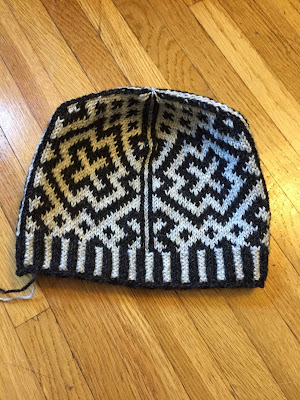 I never knew about twined knitting but it's gorgeous! I'm definitely going to have to try it. That sweater is beautiful: I hope you charged hundreds if not thousands of dollars! The swatch hats are so pretty, and then that sweater, wow! You do nice work. Wow. You certainly haven't been slacking! Sounds like a dream, going to knitting camp! And that sweater-- amazing! I'm so glad you got to go to the Knitting Camp - that sounds like an *amazing* experience! And holy crap, that sweater...it's incredible! But I'm especially loving that Twined Knitting cap - the texture is really awesome. That's a technique I really should learn! Great work - and guess which of them is my favourite! YOU are an inspiration. 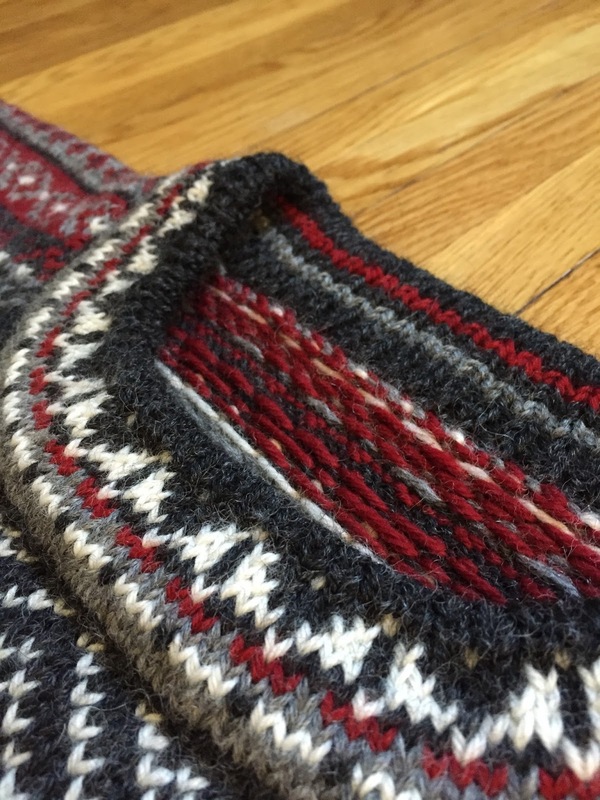 The commission sweater is stunning and I hope the recipient is duly stunned by the beautiful work you've done. It looks like perfection. I took a twined class from Nancy and also learned stranded knitting (as well as sock knitting) from her. She as my EZ, but then truly no one surpasses the knowledge EZ imparts in her books. You're learning in a short time what most people never learn in a lifetime of knitting. I love that Sweater. Must have been thousands of hours of knitting. Which needle size did you use? And which yarn? 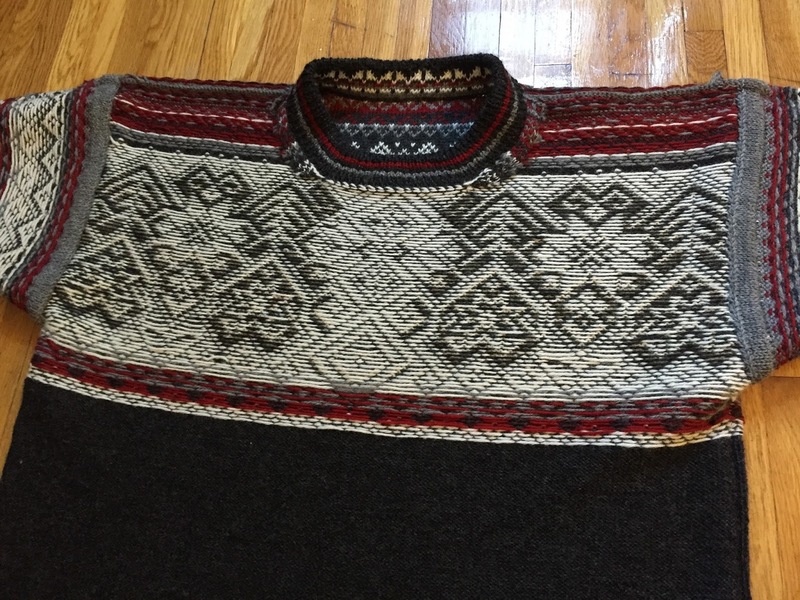 Absolutely stunning sweater - I love it on so many levels (and mostly love that you actually finished the epic thing). Wow, that is one lucky recipient! Beautiful work -- the dashes of red are perfect.